The policy appears to apply to fighters only, not other UFC personnel. It begins with an umbrella statement that fighters agree to “act in a legal, ethical and responsible manner and avoid conduct detrimental to the integrity of the UFC organization“. The Policy goes on to spell out specific prohibited conduct which is largely criminal in nature. More specific to the Mitrione situation the Policy prohibits “derogatory or offensive conduct, including without limitation insulting language, symbols, or actions about a person’s ethnic background heritage, color, race, national origin, age, religion, disability, gender or sexual orientation“, language which clearly encompasses Mitrione’s recent comments. The Policy gives the UFC the further ability to require fighters to “undergo clinical evaluation” and based on the results of this can require “participation in an education program, counselling or other treatment as recommended by a health professional“. 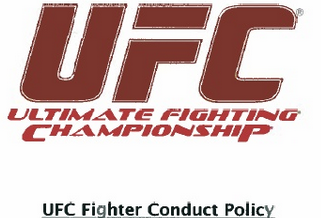 The policy sets out an initial investigative period after which the UFC can, in its “sole discretion” provide disciplinary measures which include the possibility of “fines, suspension, and cessation of service and may include conditions to be satisfied prior to the resolution of the incident“. The policy also allows “immediate disciplinary measures” which can be taken pending investigation. Fighter’s are given the right to an appeal process through arbitration administered by JAMS. Lastly, the policy provides a self-reporting requirement. If a fighter fails to self-report an incident which constitutes misconduct that failure in itself is considered “conduct detrimental to the integrity of the UFC“.